Stage 1 - Complete the online application form. There is no cost to submit this. Stage 2 - The Independent Assessor will evaluate your information and inform you if your organisation is eligible to receive the Diversity Champion Award. Your score will be reviewed and you will also find out if your Organisation would be included on the TOP 100 list. We do not charge for this assessment process. Stage 3 - A fee is only requested after you know the outcome of the assessment process and if you are included on the TOP 100 list. Successful Organisations are required to pay an administration fee (see fee details) to cover use the Diversity Champion Award logo, inclusion on the TOP 100 list, use of the TOP 100 logo and promotion of your organisation on the website, etc. If you need help with the administration fee please let us know when you apply. Diversiton has agreed to sponsor a number of places. 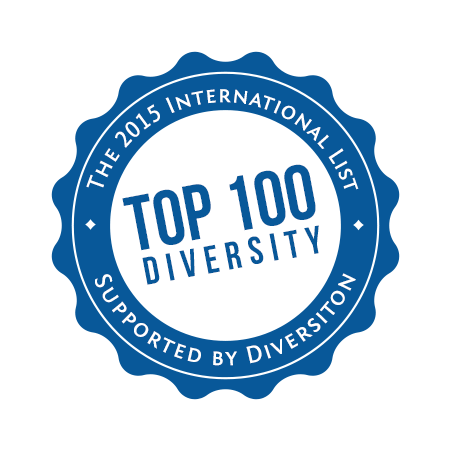 Is your organisation one of the top 100 diversity organisations? Diversity Champion Award will be collating its list of Top 100 organisations who have received the Diversity Champion Award. If you would like your organisation to be considered for inclusion on this list then simply apply online now. It only takes a couple of minutes and there's no cost whatsoever to apply. Closing date for applications is Friday 19th December 2014. This is a genuine opportunity for all organisations to be recognised for the way that they promote inclusion, equality and respect. They will be able to quote that they are 'one of the top 100 diversity organisations'. This is an international competition and is open to all organisations irrespective of type, size or location. All applications are independently assessed against a range of 86 criteria. Each organisation receives a score which is not published. The organisations with the 100 top scores will be included in the definitive 2015 list. This will be published on this website on the 5th of January 2015. Please note that all current holders of the Diversity Champion Award do not need to apply as we already have your information. Please see below some of the types of questions and criteria that are used by the assessor in the evaluation of each individual application. Please note that this is not the actual assessment form. This is purely for example purposes and indeed forms only part of the overall assessment procedure. Questions are not taken in isolation as the circumstances of each applicant is carefully weighed against these with appropriate benchmarking (size, sector, previous work in promoting diversity, etc.). 1. Is there evidence of organisation or group diversity and equality policy? 2. Do diversity and equality policies promote good relations as well? 3. Does the organisation or group have published strategy to promote equality, diversity and inclusion? 4. Do any diversity policies avoid having an adverse impact on equality of opportunities for some groups or good relations between groups? 5. Does the organisation or group take into consideration equality monitoring in developing policies and practice? 6. Is the organisation or group method for benchmarking or vetting and approving diversity policies? 7. Are diversity issues addressed in other internal/human resources organisation or group policies? For example, in recruitment and retention? 8. Are all other policies reviewed to meet organisation or group diversity principles? 9. Is there evidence of internal reviewing and monitoring of diversity policies effectiveness and implementation? Quarterly? Annually? 10. If there is a standard internal organisation or group review and monitoring of diversity policy and practice, does the organisation or group measure and evaluate the service against stated aims and objectives and identify improvements required? 11. Does diversity form a part of the overall organisation or group Social Responsibility strategy? 12. Does the organisation or group conduct internal diversity training (in-house delivery or contracted in)? 13. Are internal employee focused activities promoting diversity & inclusion? 14. Are community initiatives and engagements actively promoting diversity and inclusion? 15. Does the organisation or group aim to encourage a positive platform of engagement with other groups, communities or diverse communities? 16. Is the work of the organisation or group shared in an open and engaging way which can be accessed by a diverse group of individuals or communities? 17. Does the organisation or group seek to build on their positive diversity and inclusion strengths and qualities by internal auditing and examination of motibves and driviers for engagement? 18. Does the organisation or group actively recognise that diverse communities posess a range of skills and resources, including leadership, governance and social capital? 19. Does the organisation or group provide a diversity calendar, e-learning or other distance learning support for staff? 20. If there is a standard organisation or group review and monitoring of diversity policy and practice with respect to the cleint base, does the organisation or group measure, evaluate the service against stated aims and objectives and identify improvements required? 21. What, if any, kind of activities is the organisation or group undertaking around diversity in the community in which you operate? 22. If there is a standard organisation or group review and monitoring of diversity policy and practice with respect to the community in which you operate, does the organisation or group measure, evaluate the service against stated aims and objectives and identify improvements required? 23. Is there evidence of reviewing and monitoring of diversity policies effectiveness and implementation with respect to the enviromnemt? Quarterly? Annually? 24. Does the organisation or group have one person (or department) responsible for managing diversity? 25. Does the organisation or group implement the policies to promote equality and diversity, impartially, confidentially and with professional integrity in all aspects of service? 26. Do staff and/or volunteers influence the design and development of products and services? 27. Do staff and volunteer induction processes include formal information on organisation or group diversity and equality policies? Is the same core induction process in place for all staff? 28. Is there evidence of organisation or group commitment and knowledge of the value of diversity within an organisation or group? 29. Is there demonstration of a commitment in human and fiscal resources to the diversity agenda? 30. Is there evidence of a consistent willingness to change policies and procedures to further drive the diversity agenda? 31. Is there evidence of Top level Commitment - a vision of diversity demonstrated and communicated through the organisation or group?? 32. Are there measurements - a set of qualitative and quantitative measures of the impact of various aspects of an overall diversity programmes? 33. Is there accountability - demonstration that leaders are responsible for diversity by linking their performance assessment and compensation to the progress of diversity initiatives? 34. Is there Succession planning - evidence of an on-going, strategic process for identifying a diverse talent pool and developing them into an organisation or group's potential future leaders? 35. Is recruitment undertaken with diversity in mind - evidence of commitment to a process of attracting a supply of qualified diverse applicants for employment? 36. Is there Employee & Volunteer involvement - evidence of employee's contributions in driving diversity throughout an organisation or group? 37. Is there Diversity Training - demonstration of organisation or group efforts to inform and educate management and staff about diversity's benefits to the organisation or group? 38. Is clear commitment demonstrated for on-going improvements, monitoring and responsiveness to diversity issues in all aspects of organisation or group functions.